In a story of betrayal and revenge among a group of tough guys that would make for a pretty good Quentin Tarantino film—until someone leaks the script and Quentin Tarantino refuses to make it—someone has leaked the script for Tarantino’s The Hateful Eight, and now he’s refusing to make it. “I’m very, very depressed,” the director tells Deadline’s Mike Fleming Jr., explaining how he’d allowed “six motherfucking people” to lay eyes on the first draft of the Western he’d planned to shoot next winter, only to hear yesterday that his agent was besieged by calls from other agents, pitching their actors for specific roles. 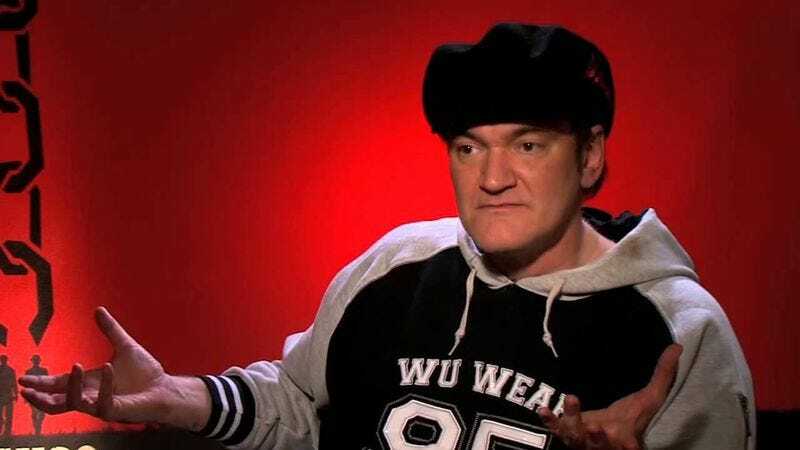 Well, those actors won’t get any roles now: Tarantino is instead planning to publish The Hateful Eight as a book, where he can be sure no one in Hollywood will read it. But whoever’s actually responsible, Tarantino is adopting the strategy of so many a grade school teacher and punishing the entire class. While he says he's cool with the usual script leaks and subsequent preemptive reviews on the Internet, this feels like a more personal betrayal. “I give it out to six people, and if I can’t trust them to that degree, then I have no desire to make it,” Tarantino says, allowing that while he may change his mind about that eventually, right now he’s moving on to film one of his “10 more where that came from” scripts instead. Obviously he wouldn’t say anything more about that, even what genre his next movie would be, though he did say it would still likely have a “big role” for Bruce Dern (as who can stay mad at that face?). Perhaps it will just be Bruce Dern, Michael Madsen, and Tim Roth locked in a warehouse, arguing over who’s the rat.